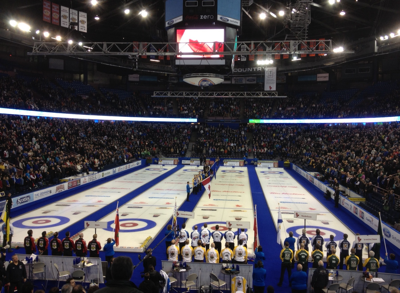 This is a (my sincerest apologies) delayed Part II to my Brier final weekend recap/analysis. You'll have to go back a couple of articles to find Part I. Can someone tell me why the Semi-final has to be played during an early morning draw when most of us are recuperating from our hangover after winning an award for this article? That's my name below the list of Brier All-stars. Yup, I was as surprised as you are. The Bronze medal game. Previous arguments I heard on this was "don't complain, you don't have to watch it" and also "it got great TV ratings". Well, now it puts the Semi-final in the morning and pushes the finals to later in the evening. I don't mind the late start to the finals but it meant I couldn't take my kids. I couldn't chance the sugar-induced-zombie-transformation that happens to my son around 9 pm, especially on a school night. It wouldn't be safe for me or other spectators in the arena. The TV excuse didn't hold this year as the game WASN'T TELEVISED. Note, it was the ONLY Brier draw which was not shown on TSN. If Toronto Sports Network Canada's Sports Leader and their sponsors don't even care, why should we? Team Howard opens with a skip+cornerguard generated deuce, and team Jacobs rebounds in the second end to tie it up. NO has the pressure on in the 3rd end but Brad makes an error on his final draw, leaving a double for a possible (if difficult) three but the shooter rolls out and Howard is back up two. They discuss throwing up a guard or running the corner guard back (green line). 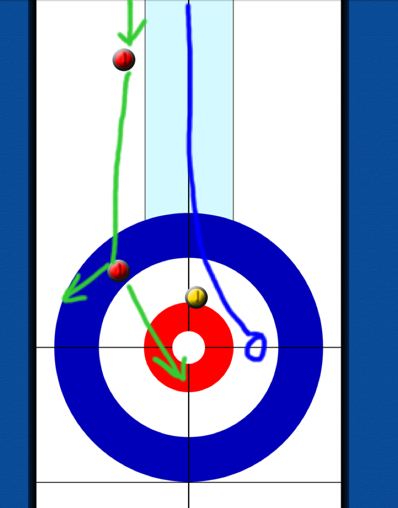 Russ comments that it's difficult to draw for second shot (blue line) and not leave a double. Up two points at this stage, they also don't want to risk giving up three. What seemed to be an overly agressive strategy by Jacobs has in fact worked to his advantage. Even if Glenn makes the runback, Brad will still have a chance at a deuce with a hit and roll. Glenn in fact misses the runback and Jacobs is able to score two points. Looking at this with rough numbers, let's estimate a centre guard attempt produces a deuce 40%, a force 50%, a steal 5% and a three 5%. We'll assume a runback will always result in a blank if made and a deuce if missed (granted, there's some small chance of a force, a steal or even a deuce, but humour me). Using those numbers, Howard needs to make the runback 55% of the time for the call to be correct. If we think 40% for the deuce is high (I do) Glenn has to be even more accurate for the runback to be correct. If we believe the chance for a runback is 70% (which I believe falls somewhere in the low end of the statistical range) appears to be close with either call. 5th end is what Northern Ontario may look back to as the turning point for their Brier. After placing a tight centre, Howard chooses a corner guard rather than come around. 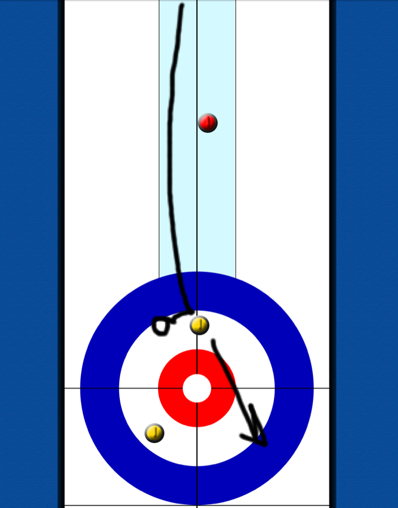 Then, on both of second Brent Laing's shots, Glenn chooses run backs (in an attempt to knock his frozen stone into the NO shot stone), rather than double peeling. He is succesful on his second shot, but there are now 4 guards in play. After a missed runback by Wayne and a missed hit by Glenn on his first, Jacobs is able to draw and sit 3. Glenn could draw on his last but its a wide path and with backing, chooses instead to throw hack weight. Wide and heavy and with a roll away NO is able to steal 2 points and take a 6-4 lead at the break. Ontario chooses a very difficult thin hit off their own, attempting to carom into the red and catch their top yellow on the red at the side to score 3 points (green lines). The rock curls a hair too much and the blue lines are the result, a single point. This is a very difficult shot with no margin for error. I wondered if a peel of the red rock top four foot for two was simple, but they never really discussed or looked at it. Let's estimate this IF the peel/pick was makeable 80% of the time. We expect the shot for three is most often either for 1 or three, ie. two would not occur often (which, based on results, appeared to be the case). Glenn has to make this shot 35% of the time in order for it to be the correct call. With a single, Ontario is now down 6-5 without hammer in a game that had seemed to be under control only 20 minutes ago. In the 7th end, Jacobs makes an angle raise hit to score two and take a commanding 3 point lead with 3 ends to play. In the 8th end, everyone, including Glenn, seems convinced Jacobs will continue to peel corner guards until he gives up a deuce. NO instead throws a guard on Brad's first shot, covering his two rocks in top eight and four foot. I prefer the runback attempt (at which Brad is very capable) but in reality the call isn't much of a mistake. The chance of giving up a three is very small and given the scoreboard, NO is highly likely to win regardless of their decision. With a steal in 8, the outcome is not really in doubt and NO upsets the team that was undefeated up until 9:30 PM on Friday night. I'm going to attack recent curling finals non-chronologically in honour of Quentin Tarantino. "How could Vincent Vega get shot, then show up later in the movie? That made no sense" my linear thinking friends said. "Why would Tarantino hire Travolta and resurrect his career?" To this question, I have no answer. When I first heard the Womens World Curling Championship would be held in Latvia, I immediately thought "why would they go to the homeland of Dr. Doom?" Then I realized I was mistaken and Latvia doesn't exist in the Marvel Universe, and barely exists in the WCF. 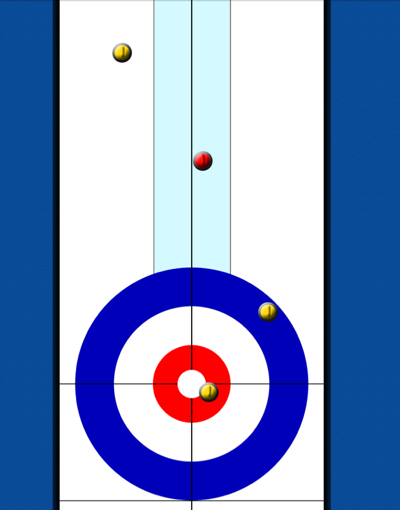 The host team did manage one victory over Switzerland on the final day of competition. Part II of Brier Final Weekend will be coming soon. Honest. The dominant young Rachel Homan rink was unable to carry on their performance from the Scotties to the Worlds, though they were very close. If not for a fraction of an inch, it could have been Canada in this game. An 8-3 record and Bronze Medal was perhaps disappointing for this team but a fine showing given their age and their experience. They will know what to expect next time and everyone, fans and players, all are betting on the Homan squad to showcase at the International stage again very soon. Sweden was held to a repeat Silver, unable to better their performance from last year. Scotland and their skip, the previously young phenom Eve Muirhead came away with Gold. Thank you to Sportsinteraction.com for having them at +450 at the beginning of the week. Scotand draws into rings. Sweden hits. Blank. Yawn. Maybe teams should just play 9 ends? Back from commercial: Is that the best wide cityscape shot of Riga they could get? Reminds me of Fort McMurray. The danger of the runback is, if missed or even if made but the promoted red stone leaves the rings, Sweden can draw around the corner again and set up a possible three with center of the house open. Scotland has a difficult shot for two (which may not have been makeable) and is held to one. 2-1 Sweden with hammer. There was very little room for error with this shot as anything above the tee leaves a hit and roll and a foot past the tee and they sit fourth rather than third. I would have preferred they hit the open rock if this is their call, but frankly a draw around centre, either with the inturn or a tap on their own with the out turn, will put the most pressue on Scotland and leave less chance for them to escape. Eventually, Sweden has a chance at a difficult double to score three or possibly four, but Maria Prytz rubs the guard and surrenders a steal of two. Huge swing of possibly 6 points. 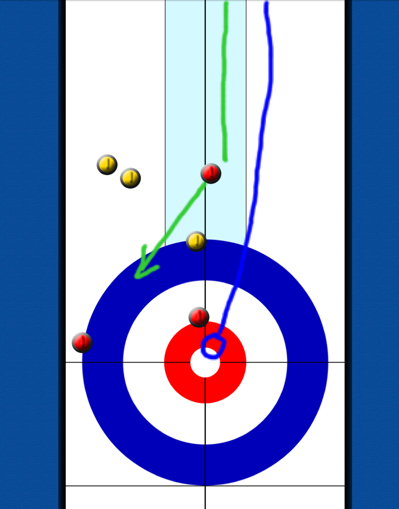 Sweden could have chosen to come around on skips (sorry, fourth's) first but instead chose a difficult double peel (green line), trying to catch their top yellow AND push it back into the shot stone AND keep it in the rings (all looked unlikely and very difficult). Sweden would have had a better chance to score two by drawing (blue line). 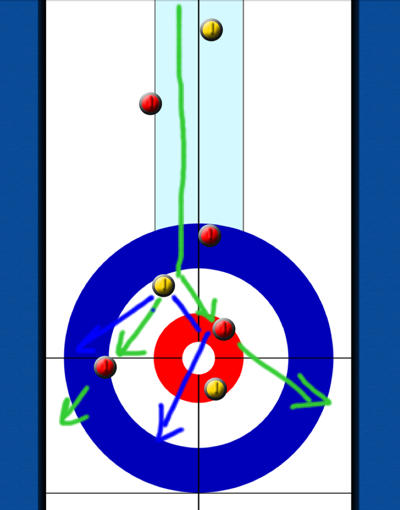 Scotland then chooses to draw open side (green line) rather than around the centre (blue line) on their last stone, leaving Sweden an open shot to the four foot for one point. An opportunity missed by Scotland I believe that had little risk (ok, maybe leaving a raise double, plus roll into the rings for two, but really?). They now have hammer and are tied at the break. 6th end. Scotland held to one. 7th end. Sweden held to one after missing a difficult hit for two. They could chose a draw for two (83% odds) or a delicate hit for possible 3 (93% odds). Vic asks and both Russ and Linda suggest they would play the shot for 3. They would be playing a difficult shot that could result in a steal or single to gain only a 10% advantage. Doesn't appear to be a smart risk to me, but Eve in fact misses the draw and their odds drop to roughly 63%. 9th end. No real trouble for Scotland and Sweden is forced to one. Tied coming home. 10th end. Sweden has a chance but Maria is heavy and her final shot doesn't curl up enough, leaving enough of shot stone open for a hit by Eve to win her first and Scotland's second World Womens Championship. A Brier Final Weekend without the "Old Bear"
There was only one Bear near the ice during the final weekend of the 2013 Tim Horton's Brier, and it wasn't Kevin Martin (it was this forest creature). The wild roars of Friday night gave way to the subtle ahems, occasional sighs and pleasant claps of the play-offs. No tie-breakers on Saturday morning, and play began with what many expected to be a preliminary bout for the eventual finalists. Ontario's Glenn Howard rink had 1st place and hammer by way of their 10-1 record. 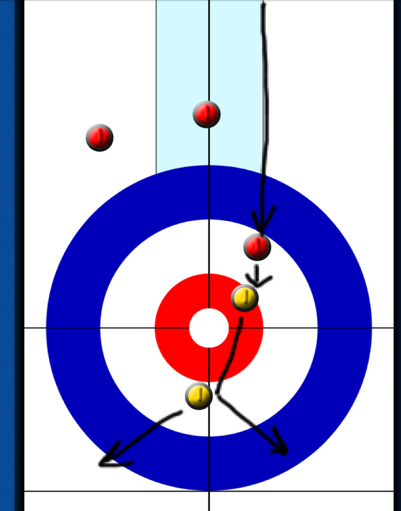 Jeff Stoughton of Manitoba, by virtue (not Virtue) of leading in draws to the button throughout the week, received the 2nd spot. With Newfoundland, Northern Ontario and Manitoba all at 8-3 and having each been 1-1 against each other, a tiebreaker needs to be made. I'm not exactly sure how this had been done in the past (though I recall a Scotties tiebreaker where teams removed a number from the buttocks of a stuffed toy, but that was many years ago...). Ranking based on the cumulative results from draws to the button over 11 games seems a very fair approach. Glenn suggested he could have had a bye for his team into the final (such as was the old Labatt Brier format, pre-Page), but this type of comment falls on deaf ears these days. If the event was purely measuring the finest team of the week, then the format would go back to pre-1980 and the best record would be awarded the trophy. We all know that doesn't work in today's sporting world (how many baseball teams make the play-offs now?). I agree that a bye would be well deserved, but hammer and choice of rocks is a considerable advantage in the 1-2 game. Based on the modern format, the best team of the weekend wins the Brier and this year it was Team Jacobs of Northern Ontario. Rather than give a full recap, I'm going to dive in chronologically on key situations that involved interesting decisions. Tied 4-4 starting the 8th end. TSN was late getting back but it appeared that Stoughton, without hammer, called for a centre guard and Howard then called for a corner guard. I wrote about this specific end situation back in 2009 in this article. Possibly Jeff was not aware of this analysis (or disagrees with it). I'd like to think he was actually thinking at the second level, placing a centre, tempting Glenn to come around and divert Howard from putting up an early corner, getting the play into the middle of the sheet. Glenn, perhaps thinking on the third (or even fourth level), doesn't bite and throws up a corner guard. A "weagle" would have been a another option for Glenn to play. I've decided that the tick shot, when played as an offensive weapon rather than played defensively during the final end, should be named after Rachel Homan's lead (and Scotties MVP, yet not All-star), Lisa Weagle. Glenn's first comment is "I don't like this" as he motions with his broom at the slash double. They could choose to hit the open rock or attempt the angle run back of their own onto the Manitoba shot stone. 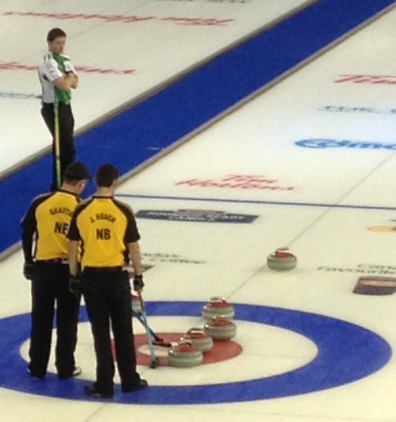 They discuss the double again and the possibility of playing it as a hit to sit two, still in good position to win, even if they jam and leave Manitoba sitting third shot (my picture is slightly off and there was some chance of the stone out of the rings catching one of the Stoughton rocks). They attempt the double and Glenn ticks the front yellow, giving Jeff a draw for three and the win. I don't mind the call, though it appeared from his comments Glenn wasn't comfortable with it initially. Stats indicate that top teams win at nearly 80% when tied in the final or extra end. Glenn is in fact 83-11 since 2003, or roughly 88%. Many of those wins came against weaker competition, so we have to expect that his chances against Stoughton are below 88% and closer to the average. Let's use 80% as the chance of winning in the extra end, and guess that the double is made only 20% of the time. Glenn needs to be certain he won't tick the guard 87.5% of the time in order for it to be the correct call. If he expects the double to be made 40% of the time, this lowers to 75%. Glenn likely expects to miss that guard more than 9 of 10 times, making it mathematically a good call as long as the double occurs 1 in 5 attempts. Hmmm, still not sure myself either. Battle of the Brads. Gushue early strategy appears to include hitting rocks in the rings with down weight on front end shots, rather than attempting freezes. In a few cases, this backfires as they leave Jacobs rocks in play and lose their shooter. 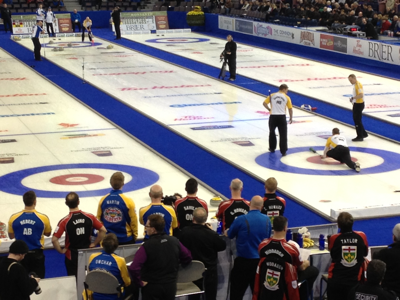 3rd end, up 1-0, Gushue makes what appears to be a perfect freeze on his last shot. His shooter comes to the face of the rock when a little high side would have been better. He's heard on air say "it's still not going anywhere" but he must have been talking about the Northern Ontario stone that he frooze against, which was nestled against another rock. As predicted, after Jacobs hit a sliver of the Gushue rock, slashing it out of the four foot, his other stone did not go anywhere. NO scores a deuce and we get a brand new Vic Rauter phrase "Calling Doctor Jacobs for surgery". They discuss whether to hit with hack weight but Brad decides to play the freeze. The problem with this call is he will likely need to make a more difficult shot later to remove the back yellow in order to score multiple points. The call leaves open the opportunity for 3, but reduces the chances for a deuce. I prefer the hit but either call can be argued competently. Gushue could have chosen to hit the back yellow and roll behind centre. This alternate call brings play back behind the centre. I understand what Gushue is hoping for. If he rolls open and NO misses the hit and roll, he may be left with a double. A case could be made for either call. If it is later in the end I expect Gushue would have called to hit the back stone. 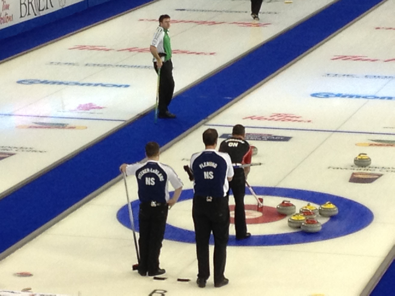 8th end, Gushue is now down 4-3 without hammer and calls a time out on third's first stone. The decsion is whether to come around to the back four with several rocks in the house, or to throw up another centre guard. I preferred the center guard. Coming in this early reduces the chance for a steal. There was a comment that Jacobs might not peel the centre. This isn't likely but they would prefer NO to be aggressive and draw. At this stage, a blank or force has little difference, NL chances will be roughly 15% to win. The center guard increases the chance of a steal and I prefer attempting a steal at all costs with a force as the other result, even if you increase the risk of a deuce. Gushue is held to one in the 9th and trails by 1 without hammer in the final end. Following an unfortunate tick on a Ryan Fry peel, Gushue is left on the pin and ends up with a steal, sending the game into an extra end. NO 2 up, then 1 up with hammer, then 3 up, then 2 up with hammer, then up 3, then up 2 with hammer. Starting with hammer for NL allowed them to stay within two points and ultimately scrap back in the last end to force an extra. Unfortunately, a pick on Adam Casey's first rock and then a hog on his second and the game went to Jacobs. 3-time Brier Champion Rick Lang joins Jordan & Kevin on the show following Brad Jacobs win at the Brier. We touch up on the importance of Jacobs win in the area, the Women's World Championship and the most famous shot in Brier history from the eyes Rick Lang himself. Gerry and Kevin are joined by the skip from the North West Territories, Jamie Koe to discuss the 2013 Brier and curling up in the Great White North. And they didn't win, and it's a shame, arguably on several levels. It's a shame that the Home Team, Alberta, whose lineup was ceremoniously shouted out by 11,855 fans during the team introductions, will not continue to play over the weekend. It's a shame that these same fans shouted, jeered and catcalled during the very late stages of the round robin, first for Glenn Howard and then for Jeff Stoughton's final shot. It's a shame that curling is stuck between two generations of fans, and I don't know which side of that fence I am on. It was one of the longest days at the Time Horton's Brier in my memory. Before the morning draw, odds were long that Team Alberta could survive the day with two wins AND have other teams stumble to the finish. Martin's odds were at their lowest right before Newfoundland skip Brad Gushue's final shot in the 6th end of their morning game. Leading 3-2 with hammer, and sitting 3rd and 4th, Brad had a makeable "crotch" double for at least 2 and possibly 3 points. Needing to hit both stones simultaneously (or possibly one stone first), he hit the other rock and scored a mere single to increase his lead to 2 points. Still down 2, Alberta was able to battle back and score a deuce in the 10th end to win 6-5 and keep their play-off hopes alive. Would that miss come back to haunt Newfoundland and the rest of the field? With a shocking Manitoba loss to the Territories during that same draw, suddenly four teams had 3 losses and the potential to drop to 7-4, and a possible tie-breaker with Alberta. With two of those teams playing each other, Newfoundland and Quebec in the afternoon draw, Martin needed only one other team to falter in order to have a chance. Quebec, my vote for scrapiest team of the week, battled back from Gushue deuces in the third and eighth ends. Trailing 4-2 in the 9th end, Menard sat 4 before Gushue's final stone. Quebec saw the formation in the house and knew it was worse for them than it looked. Brad made a triple with his last shot and Quebec had to settle for two. After Gushue finished up with a single in the 10th end, Newfoundland was in at 8-3 and Quebec sat at 4 losses with one game to go. Menard and Martin both needed a win in the final draw and a loss by either Manitoba or Northern Ontario to get to the weekend. The chance for Alberta at this point still appeared small, with a battle against undefeated Glenn Howard and Stoughton and Jacobs facing 1 win teams in BC and Nova Scotia. Online oddsmakers had Martin's chances just below 9%. The interesting thing about numbers is, they can never tell the whole story. The chase for 61 (previously written as 61*) home runs by Maris and Mantle involves the pursuit of a statistic, but has a backstory and a legacy that lived on in books and film even after both players had passed on. There was an electricity in the building that started during that morning draw against Gushue and built towards this round robin finale with all four games having play-off implications. The crowd was large (nearly 12,000), it was younger (ok, average age dropped to 53 from 58 in prior years), and it was pro-Alberta. If you could write a storybook ending in which the hero doesn't get the girl or the save the day, but comes really close, this would have been it. That 9% chance for Alberta got stretched to the limit. Both Manitoba and Northern Ontario were in tight battles, each holding a 1 point lead without hammer at the 5th end break, a position Howard also had against Martin. Quebec, in a similar position as Alberta, fighting hard from an early 5-0 deficit were down 2 without hammer. Jeff Stoughton is a veteran of this game and one of the finest players Manitoba or the World has ever seen. He's played in front of crowds before, but as the game wore on, this one became more engaged in the action on the ice, and ultimately more emotionally invested in the outcome. Briers are often battles of provinces held in other provinces. This was the Dallas Cowboys venturing into Philadelphia for a final regular season game against the Eagles to determine the division. A football game so intense they even made a movie about it, spotlighting the absurd behaviour home town fans have for their team. For a darker and more comic version of this storyline (but without the eye candy of Jennifer Lawrence or Bradley Cooper) you should really see this previous film by the writer of The Wrestler. The game between Alberta and Ontario was another epic battle that deserves a longer analysis, which I may yet do in days to come. A steal in the 8th end and force in the 9th end flipped Alberta from an underdog to a heavy favourite, tied with hammer in the final end. On Howard's last shot, the Coliseum, and old and aching building, reached decibels that, though below those of the mid-80s and the reign of The Great One, attempted to rival those of the 2010 Olympic Games. Glenn embraced the chants of "Hooowwwaaard....Hooowwwaaard", raising his hands in the air begging for more, a la Bubba Watson during the Ryder Cup (though the cheering was for the other side in his case). Good sport that Howard, then again sitting at 10-0 removes some of the pressure on his final shot. Granted, he still understood the importance of keeping Kevin Martin out of the play-offs. Glenn made his shot and Kevin his, a draw through a port to seal the victory. Both teams moved to the end of their sheet to sit and watch what was transpiring beside them. Northern Ontario had already pulled out a win by scoring three in the final end to defeat Nova Scotia 5-2. Jeff Stoughton had previously needed only an open hit and stick for his victory, but a surprising roll-out (which may have been a pick) had allowed BC to get extra time, albeit without hammer. If you rolled back the clock to the beginning of Alberta's 10th end and Manitoba's extra end, Martin's chances were about 16%. If you include the start of the 10th end in the Northern Ontario game, it was 29%, the highest it had been since their 1-4 start. BC had a rock nestled over the pin and third Steve Kopf was attempting to throw a guard. The chants of "BC! BC! BC!" may have had an effect (I'm certain Steve didn't get this type of support during playdowns) and his guard attempt slipped into the top of the house. Jon Mead doubled the stone off the button, leaving a BC rock in the back of the rings. As the noise increased and the tension mounted, BC skip Andrew Bilesky made a great shot with his final stone, to louder cheers than most 1-9 teams usually receive. Manitoba's Jeff Stoughton has had plenty of tense moments and made great shots in the past, including a draw in an extra-end against Martin in 1996 to steal one and win his first Brier. This crowd may have been nothing he's experienced before. Jeff calmly dropped into the hack and slid out, hit the four foot, and raised his fist into the air in triumph. Was it directed at the crowd? Perhaps. But it showed the emotion of this shot and of this moment. Emotion that, in a strange way, had been building throughout the week, the day and this final round robin draw. In that moment, as I watched the situation unfold, it seemed fine to me. The crowd was noisy, but didn't seem to attempt distraction (like random shouts of profanity in your backswing), and fans clapped heartily for Jeff when he made his last shot. I was also caught up in the excitement and felt like more curling events need to be like this. this game for over 30 years. With all sports I've always been a fan of the history and rich traditions that exist. 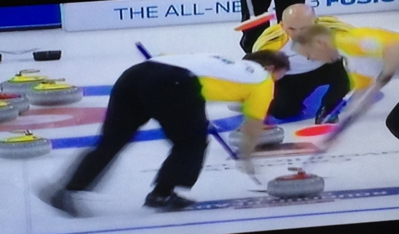 Curling, like golf, has prided itself on its etiquette. You don't cheer a missed shot (or putt). You shake hands and congratulate your opponent in defeat. And you don't make noise when someone is about to throw their rock (or hit the ball). 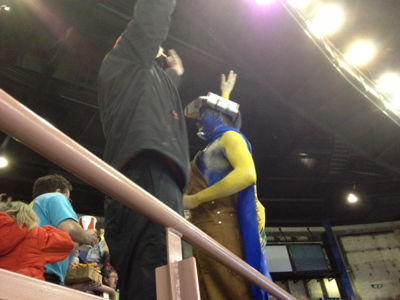 I got caught up in the moment at Rexall place, and I liked it. I liked that curling was gaining a new and younger audience. I liked that the atmosphere was thrilling and dramatic, with the sensation of overtime hockey or, more because of its static nature, the extra-innings of a major league baseball play-off game. 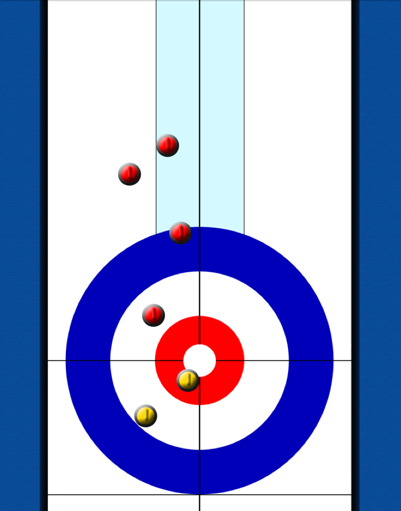 I also feel for Jeff Stoughton having to make that last shot. This isn't the game he or I grew up in. This isn't the way it's suppose to be. And I don't like that either. I don't have the answer. We may not get to decide ultimately what the role of the fan becomes in the new "Olympic era" of Curling. Unknown to most at the rink, it was rumoured that the CCA could have let Jeff retry his draw attempt if it had failed. There is apparently a rule that allows for replay of a shot that is affected by outside distraction. I expect Jeff would not have taken that opportunity if it had been presented, but what mood would the crowd have taken then? Fantastic slate of games tonight last with plenty to play for. Even the minor event, BC versus Nova Scotia, had pride on the line with the Bluenosers pulling out their first win, 9-6. This event has been bittersweet for Nova Scotia skip Paul Flemming. In his 5 previous appearances, Paul has never had fewer than 5 wins. His last two trips to Edmonton for a Brier produced a tie-breaker loss (after going 7-4) in 1999 and a loss in the finals to Ferbey in 2005. It's been a difficult week for a team that has Brier experience, but just couldn't get any momentum going this week. It also didn't help that their opponents percentages were nearly 90% against them this event. Quebec battled back against Ontario, after surrendering two early steals, but fell short 4-2 in the Under of the day. Online gambling sites have moved many of the games from 12.5 to 11.5 Total points, meaning I'll likely have to eat Subway instead of filet today for lunch. Menard dropping to 3 losses makes Friday play-off positioning more interesting. Manitoba fell to Northern Ontario 9-4 in a must win for the Jacobs rink. The 5 teams above Alberta with 3 or fewer loses don't want to fall back and possibly drop out of the play-offs or (perhaps worse) secure a date with Martin for a Saturday morning tie-breaker. Speaking of Martin, Alberta had a difficult battle against Saskatchewan, with both teams exchanging singles until Martin cracked a three in the 8th end to pull out a victory. Four in a row. Alberta started with the hammer in this game, something they did not have early on in the week. 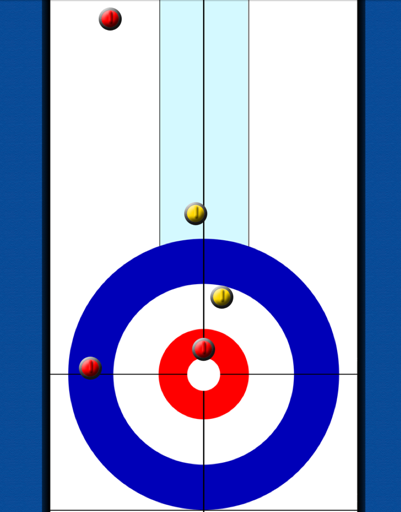 Hammer in the Brier for many years was pre-determined, then was determined by a draw to the button before the game. The problem with this was what to do when both skips covered the pin. Previously, teams would all complete a draw to the button at the beginning of the week (during the Hot Shots competition I believe, but I could be wrong) to determine ranking for tie-breakers (also used for seeding in playoffs at the end of the week). If both skips were able to cover the pin prior to a game start, hammer would go to the team which had the higher ranking in that competition. Not surprising, Martin's team often won those competitions and were assured hammer each time Kevin was able to cover the pin. In the 2009 Olympic Trials Kevin had hammer in 5 of the 7 games played. In the 2009 Brier Martin had hammer in EVERY GAME. A huge advantage and one that helped propel his squad to an undefeated record and his fourth Brier win. Stats indicate at this level teams starting with hammer win almost 60% of their games. This stat is misleading of course, as the top teams clearly don't lose 40% of the time against weaker teams when starting without hammer. However, with two teams of equal strength (eg. Martin and Howard) hammer will have that type of significant advantage. The new process for determining hammer, removes the (somewhat unfair) advantage of the earlier competition and makes teams compete each and every game in case of both teams covering the pin. Now, the first team throws until they get a measurement, regardless of how many times that takes. Teams can throw in any oprder (in fact earlier this week Ben Hebert threw first for Alberta). 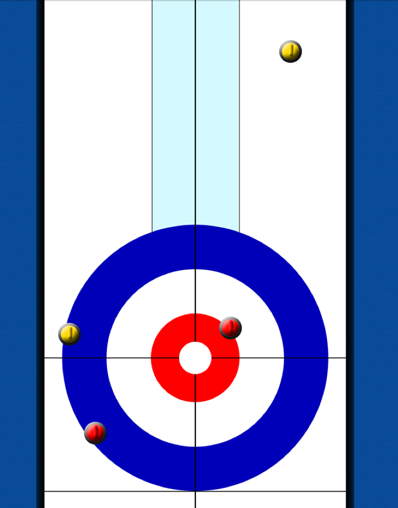 In the Saturday night game between Manitoba and Alberta, each team covered the pin twice, requiring a third shot to determine hammer (won by Manitoba). This process can take more time but it now requires teams to battle each draw, rather than have one poor shot at the beginning of the week hurt them for the entire event. I've suggested with cameras and/or sensors they could measure from the center of the rock to the button, but this seems to be a fine alternative. If it was based on feedback from 2009 (and I suspect it was) this could almost be called the "Martin Rule". I'd suggest they start showing these draws on TV (especially for 8 end games). The outcome is very critical and fans should have a chance to watch. 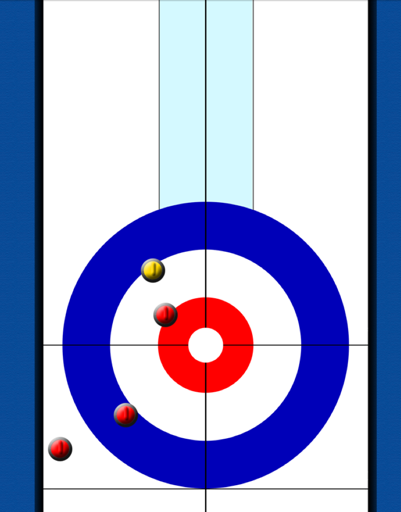 In the 7th end, down two, Manitoba had to decide whether to try a difficult draw for one or an angle raise that could score two. It was a very difficult raise but the combination of the draw difficulty and the chance of scoring a critical deuce made the shot the correct call. Also, there is a good chance Manitoba could score a single (which they did) from the raise as well. Jacobs leads 5-4 with hammer in the 8th end. They have a rock sitting top four foot and Stoughton has been placing center guards while NO has been peeling them off. Nothing else is in play. On third Ryan Fry's first, Jacobs elects to play a draw to the face of his own stone, rather than peeling the guard. This is an aggressive but questionable call. If NO can score two, they go up 3 points and win 95% of the time. If they score one they win 85% of the time. If they should instead play out for a blank (the likely result if the chose to peel) they win 86% of the time. One perspective is that, if NO is highly confident in scoring a single, they are risking 1% in order to finish the game now. The problem is that there is some chance Stoughton can steal and this would be a terrible mistake at this stage of the game (Jacobs' odds would drop to 67%). If Jacobs blanks and retains hammer in the 9th end, a similar scenario will have him reach 88% with a single or 80% if they surrender a steal. That's a 13% difference from a steal in the 8th. In order for this to be the correct call, Jacobs needs to be certain that they do not surrender a steal more than 20% of the time. It's not a big mistake and the numbers are likely fine, but, if we consider Game Theory and what your opponent wants you to do, Stoughton is elated that Jacobs has decided to draw and give him a chance this end. On the shot in question, Fry was heavy and they had to bring his rock to the back eight foot. Third for Manitoba Jon Mead then was able to make a tap and sit shot stone with two NO rocks behind the tee. As often happens however, a questionable call, followed by a miss, and Northern Ontario ends up taking 4 points and sealing the victory. Gerry and Kevin are joined by the Vin Scully of Curling, Luke Coley, to discuss rocks, ice, Team Alberta and expectations for the remainder of the week. My 9 year old son had the afternoon off today. Between PD days and Teachers conventions and days off for parent teacher nights and swimming days, field trips, and everything else, I think he actual has classes about 43 days a year. He's curled for part of the last two years, and only because he asked to (from watching it on TV). I don't expect kids need to start curling until they're around 11 and have the strength for it. I say he curled part-time because his true passion is snowboarding. Each October we've gone out to the St. Albert Curling Club on Sundays, until the snow starts to fall heavy and he switches up sliding rocks for carving the hill. I was a little surprised that he accepted when I asked if we wanted to go to watch the Brier. I think he had more fun eating a German Sausage, running around the arena and sitting in different sections (many were open) than actually watching. He also had fun trying to catch the Brier Bear so he could punch him in the stomach. I'm not proud of my parenting skills, I'm simply trying to survive. Next time I won't give him a chocolate Tim Horton's donut. 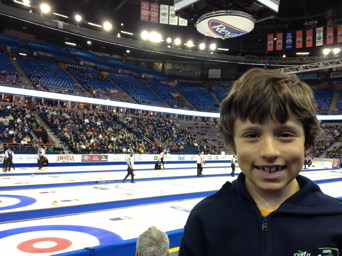 Empty seats at the Edmonton Brier and my son advising me that snowboarders have more hair than curlers. We watched a close game between Northern Ontario and Quebec. Brad Jacobs, representing the one team without a flag, battled back from a steal of two in the 5th end by cracking a three in the 7th and a steal in the 8th. When Menard failed to hit the eight foot in the 9th end, his deuce became a single and Jacobs was able to finish out with a 6-4 victory. The win tied Northern Ontario with Quebec at 5-2. Both teams had the evening off. Following Draw 11 on Wednesday night, I pulled a spreadsheet together and tried to examine the chances of Martin making the play-offs or a tie-breaker. The percentages I used are rough, based on my own opinion. 1. Martin has roughly 25% chance of going 7-4. This is largely based on the assessment he is 50% against Howard and 50% likely to get through the other three games without a loss. 2. Howard has about a .4% chance of losing all his remaining games. This is largely based on his game against PEI. 3. Gushue has about a 12% chance of losing his last three and going 7-4. Of course if he does then Howard will be at least 8-3, since they play each other. 4. Stoughton has roughly 1.4% chance of losing 3 of his next 4, and going 7-4. 5. Jacobs about a 56% chance of losing at least 2 of his next 4 games. 6. Menard has about a 68% chance of losing at least 2 of his last 4 games. Martin needs two of the top five teams to drop to 4 losses. Clearly their best chance is for Quebec and Northern Ontario to fall back. Since they don't play each other, that helps avoid an additional win. Unfortunaely for Alberta, they have no games against these two teams and can't put another loss up by beating them head to head. Martin and Team Alberta has (in my estimation) just above a 10% chance of making a tie-breaker on Saturday morning. If Martin can win both on Thursday he cannot be mathematically eliminated from the play-offs until Friday because Manitoba plays Northern Ontario. Three teams entered Wednesday night without a victory. Two of them were pitted against each other and PEI managed to pull out a 10-7 win over BC. If Nova Scotia fails to win tomorrow morning it will set-up another match-up of the winless with BC in the evening. I suspect this won't be the feature game on TSN but next year, with relegation, these contests will have new interest from fans and fellow provincial competitors. The 2013 Brier (like the Scotties) changed schedules by removing morning draws on Monday through Wednesday, pushing a full day of draws to Friday and compressing the weekend. I like the structure so far, though Thursday night won't be the same party it has been before (I suppose it'll move to Friday night). Only 6 draws will be played over these three weekdays and because less has happened, it feels like more teams are still in the hunt and nothing has really been decided yet. Not sure I like Sunday's schedule. A semi-final played early morning, the finals pushed to the evening, and the prime time slot of Sunday afternoon is filled with the ever popular Bronze Medal Game. I'd prefer to have everything wrapped up earlier in the day but we shall see how the TV audience responds. Numbers were fantastic for the Scotties I understand, despite being opposite the Oscars. One team still in the hunt but balancing gently on the bubble with 4 losses is 12 time competitor and 4 time Champion Kevin Martin of Alberta. They still have a chance to matter at the end of this week but they will need to run the table and get some help from the 7 teams ahead of them. Team Martin rebounded from their afternoon 6-5 loss to New Brunswick with their first dominant performance of the week against Nova Scotia (9-3 in 8 ends). The next two days are manageable, but the final Friday includes battles with Gushue and Howard, currently the only two undefeated rinks. Looking at Newfoundland's opening games, it appeared they could rattle off several wins and get on a roll. They did just that, avoiding an extra end loss to New Brunswick Sunday night then surviving to win 9-8 in an extra end against Northern Ontario yesterday. The path gets rockier starting tomorrow with the Territories (at 3-3) in the afternoon then 4 straight against Manitoba, Ontario, Alberta and Quebec. Tuesday included 6 of 8 games with handshakes before all the rocks were thrown. It also included 7 of 8 games Under the 12.5 point totals (with the lone Over game a 7-6 Manitoba win). The battle of Ontario was anything but. After an opening 3 by Howard, Jacobs was held to 1 and needed to get aggressive to attempt a come back. Howard was able to steal 4 points in ends 4 through 6 and it was over before it really started. One decision Brad may second guess was in that pivotal first end. On second E.J. 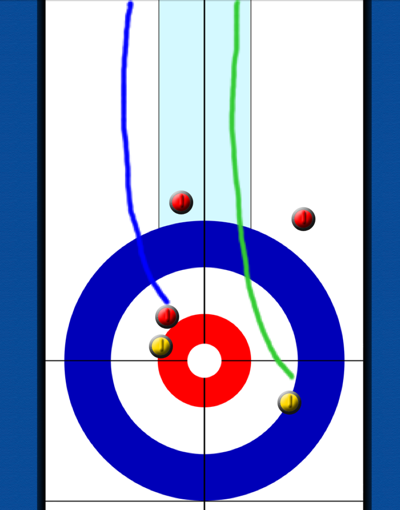 Harnden's first second shot, Northern Ontario chose to attempt a freeze on shot rock rather than a hit and roll off the Ontario stone. This is a very agressive call and Howard ultimately scores three (it was nearly four with the stone counting five having spun a half turn too far). There is some discussion by the team but ultimately Jeff seems very confident in the shot, calls it, and makes it to score his deuce. How confident should Jeff be to make this call? A single puts Manitoba at 63.4% chance to win. By scoring 2 they increased their probability to 85%. A significant improvement. Even attempting the raise double, Manitoba may score a single some of the time. A steal by Virtue would have dropped Manitoba to 36.6%, a big mistake. It appeared most likely either a deuce or a steal (too full and the yellow might miss the back rock, too narrow and it might jam) - let's estimate it at 10%. Jeff would need to make the deuce about 50% of the time for it to be the correct call. Kevin and Gerry are joined by Manitoban Chris Jensen for a brief chat on the media bench. 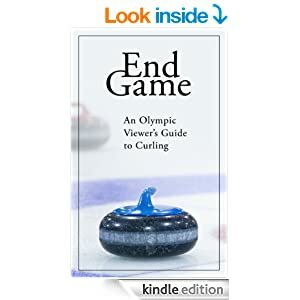 I'm not sure when it was I first heard of online sports-books taking wagers on curling. Might have been 2008 or maybe 2009. In any case, I resisted the urge for many years. 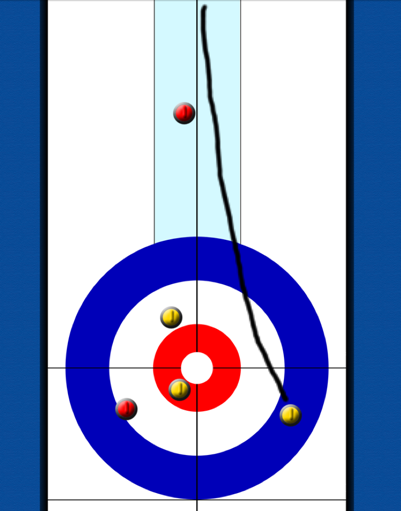 As a fan of numbers, and in my belief some advantageous insight into curling, I always suspected I'd have an edge. But still, I resisted. Let's go back a little further. Gambling likely started for me, like many, during a game of crib with my dad when I was 9 or 10. "Let's play for a quarter" he may have said. When grandma and grandpa visited, there were Rummoli games where a jar of pennies could last me deep into the night (about 10PM). Eventually, my friends and I, like many, would play various games for quarters and then, bless our Canadian Mint, the Loonie, which was like your very our own $1 casino token. Often we played various forms of home game poker, like follow-the-Queen, Kings-and-little ones or low Chicago. We'd also play crib, 31, hearts, then migrated our games of chance to the pool table and, on occasion, betting sports. I was a tender age at the beginning of Sports Select (legalized sports betting in Canada, controlled by the government) and thought my early systems for baseball and hockey betting were fool proof. My "systems", which were largely based on intuition and grade 7 math formulas, didn't hold up for very long. Over time, I realized that sports betting was like the stock market. If you're not prepared to put in the time to study and learn and understand it better than the average person, you are at a huge disadvantage. Not everyone has time and money to build an advanced simulator and hire a MIT grad to run it. I vowed only to bet sports when I travelled to Vegas, and to keep wagers to a comfortable level for purposes of entertainment only. I knew that if I were to take my interest in probability and analytics and combine it with my love of sports, my life would lose all balance. So I resisted the urge to bet curling for several years. It was almost an embarrassment that the Curl With Math guy wasn't be using his numerical savvy to break the bank of pinnaclesports.com or sportsinteraction.com. For some reason I decided 2012/13 would be the Season I dipped my toe in. After mild success at the Canada Cup and the Scotties, I'm all in at the 2013 Brier. I've followed the lines for several years and looked for trends and opportunities. Naturally, now that I'm placing real dollar bets, everything theory I had in the past appears to be false. It could be short term variance, or it could also be the same problem I had with my Sport Select "systems" 20 years ago. I'm going to stick with it for now, but if things don't improve, I'm going to give it up, or hire one of these guys to build me a simulator. The problem was resolved when Paul received new shirts later in the day. I started to think they had simply gone over their team quota for lettering, with Fitzner-LeBlanc and fifth man Kent Smith (sporting his full name on his back) the main offenders. I can't recall seeing an end where someone with a two point lead may have needed a great draw just to hold their opponent to a steal of three. As it turned out, Saskatchewn skip Brock Virtue came a little wide on his last (see 5th shot hiding behind Roach in the photo) otherwise Grattan wouldn't have had a chance to make the draw for a single point. Saskatchewan eventually battled back to tie the game with a 3 in the final end, only to lose in the extra end and fall to 2-3 (the same record as New Brunswick). 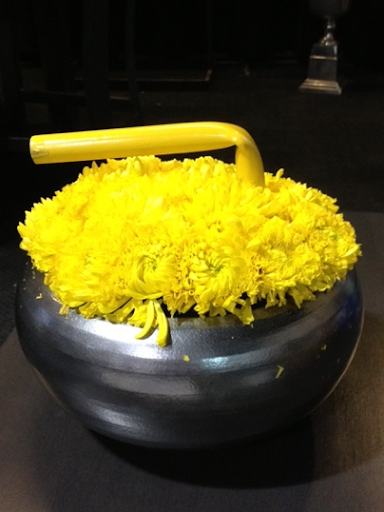 The 2013 Tim Horton's Brier includes several large flowery curling rocks (you may catch a glimpse on TV) and also is fashioned with these table center-pieces. Wait, wasn't The Scotties last weekend? If I wanted exercise I wouldn't have gone to the Brier. On the ice, Newfoundland polished off PEI swiftly and Jamie Koe of NWT/YT continued their scoring prowess by cracking a 5, immediately after surrendering a 3, and ultimattely winning 10-7 against New Brunswick. (Think OVER when betting this team). Ontario had an early scare, falling 3-0 to BC, but managed to battle back with a 3 in the third end, several steals and an 8-4 victory in 9 ends. The Martin vs Stoughton match was the Saturday Night Main Event. An entertaining game though not the most well played. Both teams no doubt are still adjusting to ice conditions and these new CCA rocks, which appear to curl across the width of a sheet if you're not careful. Nearly 6 feet for draws was seen in some places. Jeff can choose a simple hit and stick for 1 or the long cross house double to score a possible deuce. Jeff chooses the double attempt, hits the shot stone too thing and Martin steals one and heads to the tenth end up 4-3 without hammer. Manitoba is forced to one in the 10th and ultimately steals the win after some surprising misses by Alberta third John Morris in the extra end. MB scores 1 point = 60% odds to win. Jeff may consider that Martin is better than average but in fact this has not been the case. Historically Martin wins in this position (one down with hammer) roughly 40%. MB scores 2 points = 92%. Looking at a simple equation (haven't seen one of these in a while), let's use x as the odds Jeff considers to make the double and y the odds that he misses the double but still scores 1 (hits and rolls out). Because there are two factors it becomes a more difficult analysis. Looking at this very conservatively. If we expect Jeff to at least hit the stone 50% (x+y=.5) of the time, he will need to make the double at least 31% or roughly 2/3 times that he actually hits it. Jeff may expect to hit the rock 70% of the time. If so and he would need to make the deuce only 19% of the time or roughly 2/7 when he actually hits the rock. I don't agree it was the correct call or at the very least it was borderline, but if Jeff believes he can at least hit the second shot stone 70% or more, than it is the correct call. It just looked like a long way to me. Biggest show so far, Scotties recap and Brier preview. Look for regular uploads during the Brier as Gerry, Kevin, and Jordan will be live for on-location in Edmonton.